These articles take a look at the cause of yeast infection in the human body. What is obvious and the not so obvious and how it can be applied to any form of fungi today. All 400 species that can affect the body work basically the same, although the main species of yeast infects you from within. After you have read it, you will understand what to avoid in your diet and life so you can speed your recovery and prevent further yeast infections. Adult humans have 3 to 4 pounds of beneficial bacteria, which number about 70 trillion individual organisms, living in our digestive system. Yeast is present in many of us in very small amounts. In healthy people, this healthy level of yeast is undetectable with stool tests. The shear strength in numbers of the beneficial bacteria keeps yeast in check. If this balance is altered and the good bacterial levels are reduced, yeast, being very opportunistic, will spread and take over as a yeast infection. Under the right conditions it can double its population in an hour. An over growth can cause a wide variety of unhealthy side effects and diseases as the yeast tries to turn you into dirt. However, I have seen stool test results showing high numbers of good bacteria and high levels of candida yeast. Usually, these species of candida are not candida albicans but one of the other candida species, especially candida glabrata. Many times these infections are because of the predisposing causes of yeast infection below. According to Talha H. Imam, MD, Assistant Clinical Professor in Internal Medicine and Nephrology, University of Riverside School of Medicine, fungal urinary tract infections usually occur with catheters. C. albicans prostatitis occurs infrequently in patients with diabetes but sometimes does happen. 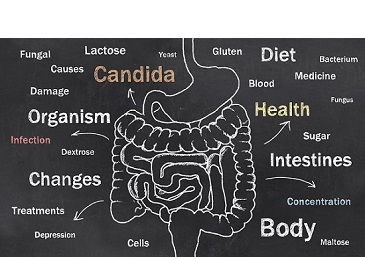 Candida kidney infections usually occur only in high risk patients with diabetes and those who are immunocompromised because of tumor, AIDS, chemotherapy, or immunosuppressants. With catheters, the yeast simply grows on the plastics from unsanitary conditions or from airborne yeasts in a hospital environment. It can then enter the urethra and can possibly get to the kidneys if not treated. It can also originate from the gi tract and occurs mainly in patients with nephrostomy tubes, other permanent indwelling devices, and stents. Once it reaches the kidneys, the person usually dies as the yeast literally eats the kidneys and shuts them down. Although this is not a cause of yeast infection, it does create many health problems so I should mention it, is mold growing in ventilation systems. I have personally seen this condition inside air conditioners. These mold spores blow into the home, and once you breathe them, they can travel through out your respiratory system, causing asthma, bronchitis and chronic allergies. In the links below I talk about what the main cause of yeast infections are in other wise healthy adults and children and how to correct them. I would read each one to see if it applies to you so you can correct the problem if it does. Antibiotics can cause yeast infections. Without a doubt, antibiotics are a cause of yeast infection because they kill the good bacteria that keep it under control. On this page you'll find out how they do this and how to fix and prevent this from happening. Toxic foods can also kill your good bacteria. While we are on the topic of antibiotics, did you know that Roundup was originally patented as an antibiotic? Read that page and find out if the Roundup poisoned foods you've been eating are killing your good bacteria and causing your yeast infection. The presence of mercury in the body contributes. It has been proven that candida yeast infections are 67% more prevalent in those that have mercury in their bodies. So if your levels are high and you do nothing to solve the problem, it will be extremely hard to get rid of your candida yeast infection. This webpage gives you the resources so you can find out if this is a problem for you and if it is, how to correct it. Excess estrogen fuels candida yeasts growth. The hormone link as a cause of yeast infection for women is very common. Almost all women that suffer from recurring vaginal yeast infections will tell you that they do indeed get flare ups around the third week of their cycle. Check the symptoms list on this page and see if it applies to you. If it does you can take the recommended steps to re-balance your hormones. Processed high carbohydrate foods contribute. The Western diet is far from ideal so some foods contribute to the cause of yeast infections. On this page you will learn what you should and shouldn't be eating. Sugar is the primary food source for yeasts. On this page I give you the details about sugar and what it is doing to your immune system and body. Stress contributes due to lowered immune function. To much stress can reduce immune function by up to 50% and a healthy immune system is needed when fighting yeast. On this webpage you will learn how stress effects your body and how to get it under control. This webpage contains a list of medical candida tests you can do as well two home tests you can use, to verify if you really do have a yeast infection or not. Many of these tests will also reveal the cause of yeast infection in your body, typically low good bacteria counts. If you have any questions about the cause of yeast infection or any other questions. Please fill out the form on the contact page.